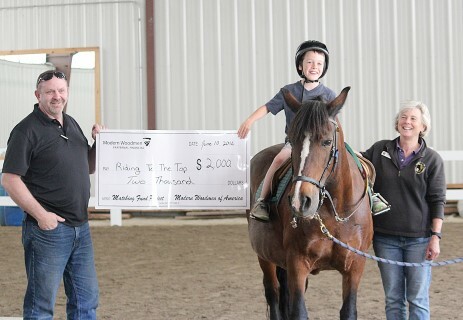 Tim Graham of Modern Woodmen of America recently presented Riding To The Top Therapeutic Riding Center (RTT) with a matching gift of $2,000. The organization’s local members participated in RTTs 2nd Annual Dances with Horses event and Graham said, “It’s always nice to be able to give back to people and organizations in Maine but even better when it’s your hometown.” Over $7,500 was raised at the event thanks to Modern Woodmen’s matching funds. Sarah Bronson, executive director stated, “Modern Woodmen’s matching gift will help hundreds of people with disabilities experience the healing powers of horses this summer.” Bronson went on to note that “RTT is a nonprofit charity and receives no federal, state or municipal funds. Dances with Horses and our signature fall event, Triple B~Boots, Band in BBQ in October, are vital to the riders, horses and programs at Riding To The Top Therapeutic Riding Center (RTT). Modern Woodmen Fraternal Financial was founded in 1883. Ever since then, we have been helping families fulfill their financial needs and making an impact in communities nationwide. Our main purpose is to help members plan for their financial security through insurance, investments. Modern Woodmen fraternalism is about coming together and making a positive impact on each other and on our communities. It’s about being part of something bigger than yourself. For more information contact Tim Graham at the Windham office at (207) 892-0302.